1.This book is not useful for today's students. This book is ▲ for today's students. 2. Mary has been in Hong Kong for a month. Mary ▲ Hong Kong a month ago. 3. In the past people thought the earth was flat. People ▲ to think the earth was flat. 4.The family didn't have enough money to send her abroad. The family couldn't ▲ to send her abroad. 5.There were about fifteen people in the room, and most of them were women. There were about fifteen people in the room, ▲ women. 1. What was the s ▲ of the car at the time of the accident? 2.He was sitting a ▲ a group of children, telling them a story. 3.The room is very dark. I can't see anything c ▲ without a light. 4.Kindness is the language that even the b ▲ can see and the deaf can hear. 5.Even children can understand the story because it's written in very s ▲ English. 6. This dictionary ▲ （包括）almost all the English verbs. 7.Cleaning the car is one of my least favorite ▲ （工作）. 8.Ann is ▲ （安排)a surprise party for Russell's birthday. 9.The best ▲ （治疗）for a cold is to rest and drink lots of water. 10.I ▲ （借给）my penknife to someone, but I can't remember who it was now. On my eighth birthday, Dad bought me an accordion(手风琴） and said excitedly, "Once you learn to play, it'll stay with you for life." But I didn't want to play it. Ijust wanted to play games, But Dad asked me to take accordion lessons. One day, I found a box in a corner. When I opened it, I saw a beautiful violin. "You’re your father's," Mum said. "His parents bought it for him. I guess he got too busy on the farm to learn to play it." I had to practice half an hour every day, and every day I tried to get out of it. But Dad didn't allow. I asked why. He answered, "Because you can bring people joy. You can touch their hearts." He added softly, "Someday you'll have the chance I never had: you'll play beautiful music for your family. And you'll understand why you've worked so hard." I was speechless. The lessons stopped after I finished high school. When I grew up, I got married and moved into a new house. I put the accordion in the attic（阁楼）. One afternoon, my two children found the accordion by accident (偶然). They got very excited. "Play it. Play it," they laughed and said. I started to play some simple songs. I was surprised I could still remember them. Soon the kids were dancing. Even my wife was laughing and clapping to the beat. At that moment, my father's words came back to me, "Someday you'll have the chance I never had. And you'll understand." I finally knew why Dad had asked me to practice hard. Dad never learnt to play his violin. But I told my family, "This is my father's music." 1.My father didn't learn to play his violin when he was young because _______. 2.How might the writer feel when he had to practice playing the accordion? A. Delighted. B. Excited. C. Bored. D. Relaxed. 3. "Dad didn't allow" means "_______". A. Dad didn't let me do it. B. Dad didn't stop me doing it. C. Dad didn't help me do it. D. Dad didn't see me do it. 4.Dad asked me to learn to play the accordion so that _______. This is not a diet. It's a simple way to lose weight. And you don't even have to give up the food you love or join a gym (健身房). You just follow some habits that thin people have. Keep them, and you'll become thin. When you wake up in the morning, sit up slowly without using your hands. With legs straight out, bend(弯曲) forward until you feel sore（酸痛） in your back. It will bum about 10 calories. When you have a meal, order a clear soup, and have it before having the main food. In this way, you'll feel fuller, so you'll eat less when the main food comes. Apples are full of fiber and water, so your stomach will want less. The study shows that people who eat at least three apples a day lose weight. Every time you use the mobile phone, stand up and walk around. Heavy people sit on average (平均）two and a half hours more each day than thin people. This skill is very important as standing up and walking around will bum 50 0r more calories. Use these skills, and you will have a big weight loss. 1.We should have soup first so that _______. 2.Which of the following may the writer NOT agree? A. Sitting up slowly without using your hands helps bum calories. B. Eating apples every day is good for people's health. C. You have to join a gym if you want to lose weight. D. It's good to walk around while talking on the mobile phone. 3.This passage is written to _______. 4. In which part of a newspaper would you most probably read the passage? A. Shopping. B. Teaching. C. Family. D. Health. 1.We may see this in a _______. 2. Which word can be both a noun and a verb? 3.How many words are explained here? 4.Don 't make any noise when I'm recording the song. 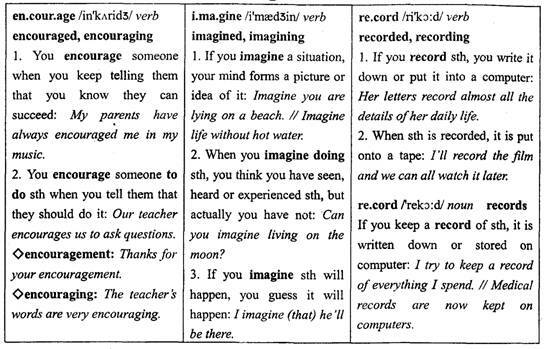 The word "record" in the above sentence has the same meaning as in "_______". A. I try to keep a record of everything I spend. B. Medical records are now kept on computers. D. Her letters record almost all the details of her daily life. when he was young. To have fun, Walt began drawing. In 1928, Mickey \ Mouse was created and became world-famous at once. He soon drew other cartoon characters like Donald Duck. Then Walt decided to open theme parks. In 1955, Walt Disney himself opened the first Disney park in California, USA. Later, another Disney World opened in Florida, USA in 1971. Tokyo Disneyland opened in Japan in 1983, and Euro Disney opened in France in 1992. In 2005, the world's fifth Disneyland opened in Hong Kong, China. Hong Kong Disneyland is the smallest of all Disneylands, but the Adventureland in it is the biggest one of all. On April 8th, 2011, Shanghai Disneyland project started in Pudong New Area. park will be the world's sixth Disney park and the first one on the Chinese mainland, It will also be the third of its kind in Asia. The park will be built in about five years and will possibly open in 2014, at the earliest. It may attract 7.3 million visitors in its first year. 1.Which may be the best title of the passage? 2.How many Disneyland parks are there in the world now? A. Six. B. Five. C. Three. D. Two. 3.Which of the following about the Shanghai Disneyland is NOT true? A. Shanghai Disneyland will be the first Disney theme park in China. B. About 7.3 visitors may come to Shanghai Disneyland in its first year. C. It will take about five years to finish building the Shanghai Disneyland. D. Shanghai Disneyland will have the biggest castle of all the Disney parks. 33 your time carefully. You should make a 34 of things that you have to do. First write down the time for eating, sleeping, dressing, etc. Then decide on a good time for studying. Of course, studying shouldn't take all of your time. Don't 35 to leave yourself enough time for hobbies. Find a good place to study. Look around the house 36 a good study place. Keep this space. It may be a desk or just a corner of your room. N0 37 , radio, or television! When you sit down to work, think only about the 38 ! Make good use of your time 39 . Listen carefully to what the teacher says. Careful listening means 40 work after class. You also need to take notes, because it can make it easier for you to learn well. These are only some of the ways to help you with your studying. I believe you'll find more other ways besides these. —Where did you go last night? －I _______to go to Lily's birthday party. －So what have you learned? －We've learnt _______about life in poor areas. Which of the following is NOT right? If you don't like the programmes, you can just— the television. －Are people around you used to _______things online? －Yes. It's much easier, and also cheaper. You _______have a wrong number. There's no Mr Johnson here. I haven't gone back to my hometown _______I left it in 1993. －I'm too nervous to give a talk in front of so many people. _______, Lucy. You can do it. No one wants you to be _______ but we really want you to do your best always. －Could you please help me check what's wrong? －Sorry, I don't have much _______of the computer. －Why does the river smell terrible? －Because the water_______. 一Have you read today's morning paper? －Not _______. What's the latest news? －How about the pollution in the countryside? －Luckily, it's not as serious as _______ in the big cities. They had to operate _______his arm because it was broken in two places. －It was _______ great fun to be a host, wasn't? －Yes. That's _______ experience hard to forget. David (D) and Tina (T) are talking about what they are going to do in the future. T: What are you going to do after leaving school? D: 1. I would like to explore strange things. D: Of course, I do. I like to visit different places. T: That’s good. You seem to be good at spoken English. 3. D: It’s just so – so. I’ll try to learn it better. 4. T: Maybe I’ll be a P.E. teacher. I feel like playing all kinds of games with children. T: I hope my students would like me and enjoy themselves, too. A. What do you want to be? B. Do you like traveling? D. It seems that you’ll enjoy yourself at work. E. Are you going to be a teacher? F. I am thinking about becoming a guide. G. Great. Being a teacher is proud. How did we help to save our earth this week? Let me tell you. First, my family tried to save ___1___. We never left the lights on when leaving the rooms. We turned off the TV when ___2___ was watching it. Mum only used cold water in the washing machine. Second, we started ___3___ this week. We tried to write on both sides of our paper, not just on one side. We also ___4___ our rubbish into different bags. Mum kept the plastic shopping bags from the supermarket to use them __5___ rubbish bags. Third, my family started to save water. We stopped __6___ long baths and had short showers ___7___. We washed the toilet with used water. Mum and dad used less water to do the washing. My sister and I didn’t leave the tap running when we __8___ our teeth. At last, mum and dad began to save gas. Mum used to drive us to school, but now my sister and I started riding our bikes to school. It is 9____ work but good exercise. This week dad and a few of the people in his company also started to go to work in one car and share the costs. These are great ways ___10___ protect our environment. When Mr. David retired, he bought a small house in a village near the sea. He liked it and hoped to live a quiet life in it.But to his great surprise, many tourists came to see his house in summer holidays, for it was the most interesting building in the village. From morning to night there were tourists outside the house. They kept looking into the rooms through the windows and many of them even went into Mr. David’s garden. This was too much for Mr. David. He decided to drive the visitors away. So he put a notice on the window. The notice said: “If you want to satisfy your curiosity（好奇心）, come in and look round. Price: twenty dollars.” Mr. David was sure that the visitors would stop coming, but he was wrong. More and more visitors came and Mr. David had to spend every day showing them around his house. “I came here to retire, not to work as a guide” he said angrily. In the end, he sold the house and moved away. 1. Where did Mr. David live after he retired? 2. Why do many people want to see Mr. David’s house? 3. Can Mr. David stand the visitors? 4. What did Mr. David do to drive the visitors away? 5. How did Mr. David feel when visitors kept coming to see his house? Living in the foreign culture can be exciting, but it can also be confusing. A group of Americans who taught English in other countries recently discussed their experiences . They discussed that miscommunications were always possible, even over something as simple as “yes” and “no”. On her first day in Micronesia, an island in the Pacific, Lisa thought the waitress wasn’t paying any attention to her. The day was hot she went into a store and asked, “ Do you have any cold drinks ?” The woman there didn’t say anything. Lisa repeated the question again. Still the woman said nothing. She later learned that the woman had answered her: She has raised her eyebrows , which in Micronesia , it means, “yes”. Jan remembered an experience she had in Bulgaria, a country in Europe. She went to a restaurant that was known for its cabbage. She asked the writer, “Do you have cabbage today ?” He nodded his head. Jan waited, but the cabbage never came. In that country, a nod means “no”. Tom had a similar problem when he arrived in India. After explaining something in class , he asked his students if they understood . They answered with different nods and shakes of heads. He thought some people hadn’t understood, so he explained again. When he asked again, the did the same thing. He soon found out that his students did understand. In India, people nod and shake heads in different ways . It depends on where they come from. 1.These Americans teaching English in other countries found that they _____________. A. needed to learn foreign languages. 2.People in Micronesia show “yes” by _________. A. nodding heads B. raising the eyebrows C. shaking hands. 3. Tom misunderstood his class at first because __________. 4.Which of the following is TRUE according to the passage? C. Lisa was trying to buy some cabbage. 5.The passage is mainly about _________. Modern life is impossible without traveling. The fastest way of traveling is by plane. With a modern airline you can travel in one day to places which it took a month or more to get to a hundred years ago. Traveling by train is slower than plane, but it has its advantages. You can see the country when you are traveling through. Modern trains have comfortable seats and dining cars. They make even longer journey enjoyable. Some people prefer to travel by sea when possible. There are large liners and river boats. You can visit many other countries and different places. And traveling by sea is a very pleasant way to spend a holiday. Many people love to travel by car. You can make your own timetable. You can travel three or four hundred miles or only fifty or one hundred miles a day, just as you like,You can stop wherever you wish where there is something to see, at a good restaurant where you can enjoy a good meal, or at a hotel to spend the night. That’s why travelling by car is popular fpr pleasant trips,while people usually take a train or plane when they are travelling on business. 1. From the passage we know the fastest way of travelling is _______. 2.The underlined word “they” in the 2nd paragraph refers to _____. 3. If we travel by car, we can__________. 4.When people travel on business , they usually take ______. 5.How many ways of travelling are mentioned in the passage ? 1. What job is wanted above? 2.__________ will probably get the job. A. An English lady at the age of 27. C. An Australian of 35 with a teacher’s licence. 3.What is not mentioned ? 4.If a foreigner wants to have an interview, he or she should make it ________ . 5.What do you think it is ? A well-dressed man came into a famous jewellery （首饰）shop. He explained that he wished to buy a pearl（珍珠）for his wife’s birthday and that the 16 did not matter since business had been very good for him that year. After examin;ing a number of beautiful and valuable pearls, he chose a nice black one that _17_ $5000. He paid for that pearl , shook hands with the jeweler and left. The jeweler was quick to pay her _28_ she changed her mind. Then he called the rich man’s hotel to tell the good _29_ to him. The rich man, however, was _30_ to be found. He had fled with the old woman a few more minutes before. Copyright @ 2014 满分5 满分网 ManFen5.COM. All Rights Reserved.